What’s the deal with dogs that greet you with a toy when you walk in the door? I don’t mean to sound like Jerry Seinfeld here, but I’ve always wondered why Haley does this. Sometimes she does a little panic routine as she frantically searches for something to put in her mouth. Usually it’s a toy laying nearby or an abandoned sock from the previous night’s sock ball ritual but she normally tries to find something that she can bring to the door when I arrive home. So, why does my dog greet me with a toy? Here are some of my theories. Maybe she missed me so much that she wants to celebrate my arrival by presenting me with a gift. How sweet! Nah, surely she would pick something other than a dirty sock that I wore the day before or a worn-out, gutted duck if it were a gift for me. Plus, she doesn’t want to give up the toy right away. If she does give it to me, she usually takes it right back. She’s a retriever mix and that’s what retrievers do. That sounds logical, right? They have soft mouths and were bred to retrieve things. But that doesn’t explain why so many different types of dogs do the same thing. 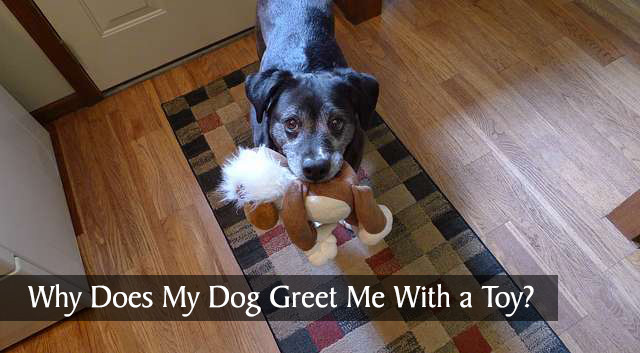 Terriers, herding dogs, all kinds of breeds and mixes exhibit this toy greeting behavior. She was so bored while I was away, she can’t wait to have some fun with me. That might be true for some dogs, but Haley’s not interested in fetching the toy or playing tug-of-war, she’s only interested in greeting me and having a love fest. She’s greeting her alpha dog and showing respect. I’ve read that in dog packs, lower ranking dogs will give up valuable items to the alpha to show respect and submissiveness. No, I don’t think so. Haley respects me but I don’t believe we have that kind of hierarchy relationship where she views me as some type of alpha figure that she has to submit to. She’s been trained to do it. The first few times she brought a toy to the door, a fuss was made over her and now she assumes it makes me happy. Hmm…that sounds like a possibility. I’m always happy to see her and greet her, but I’ve never made a big deal about the toy. That also doesn’t explain why she did it on her own the first few times. It’s a calming behavior for when she’s overly excited. She’s so excited that grabbing a toy helps her channel that excitement and calm down. That’s an interesting theory, but she only does this when I come home and not other times when she’s overly excited. Sometimes when I come home and she’s been napping, she greets me in a quiet low-key manner but still grabs a toy. It’s a way of displaying happiness. Dogs don’t have a lot of options for how they can show various emotions. They can’t hug us or clap their paws when we arrive home, so they use their mouths to grab a toy to show happiness. Could be, but there are other times when Haley’s very happy, like when we’re headed out for a walk or a car ride, but she doesn’t want or need a toy. It’s such a sweet homecoming to be greeted by a happy, wiggling dog holding a toy in her mouth. Even though I still don’t know why my dog greets me with a toy, the last two theories make the most sense to me. What do you think? Does your dog do this? I’d love to hear your thoughts and theories! Yes, I’m not sure if we’ll ever know why they do it, but it’s really a cute behavior. Great post! I have 3 dogs, and 2 of them are toy greeters. Tucker will often bring one to the door when I come in. Jasper will pick up a stuffie when I sit down to say hello to everyone. Tucker also grabs a toy when he I go out in our backyard for a “wildlife check” (to make sure no baby animals or dumb squirrels are in the yard) before I take the dogs outside. My thinking is it’s an energy channeler. They’re so excited they don’t know what to do so they grab a toy. That’s so cute that Tucker takes a toy along on the wildlife check. Our wildlife checks here are for skunks late at night, lol! I think it’s a good possibility that you’re right about toy grabbing being about excitement. I had a labrador retriever who ran to get something anytime anyone came to the door. He usually ran to the laundry hamper, opened the lid and pulled out some underwear. Our front door had glass panels so I wondered how many times the UPS driver must have cracked up when he/she was greeted by my dog with one of my bras or a pair of my husband’s boxers shorts in his mouth. That’s too funny. Haha. We gotta love ’em, don’t we? BOL! Although y’all see me carrying things outside and helping out by carrying things inside, I prefer to bark and leap about when my Human returns. You’re so productive and helpful, Hawk! I’m going to have to work more with Haley on helping with carrying things for me. She’ll carry in the mail, but tends to drop it once inside instead of handing it to me. I have no idea why they do it, either, but I love that they do! Barley stays in her crate while I’m gone, but when I let her out, she always has to pick out one of the toys she has in there with her to carry out with her and tote around until she goes out to potty! That’s sweet that she takes her toy outside with her. We have to watch Haley because she’s always trying to sneak socks outside. I think she would like to plant them to see if she could grow a sock garden! That photo is perfect! The eyes say it all. LOL that is too cute! I think it’s a play thing most likely, but like you said, it could be numerous reasons haha! I think that’s true for some dogs, it’s a cue to play. One day we might know what they’re thinking. Leo used to do that all the time. He’d run to the door, then double back as if he had to first see who was there to determine what toy to grab. I (like so many other people) thought it was the retriever in him also. Who knows why, I just think it’s adorable. That’s so interesting, Cathy. Maybe if Leo brought his favorite toy, you were really a special guest! Meko always brings a toy; if not he doubles back to get one. Really cute for a border collie with too many smarts. My Shadow would always “smile” when we came home. So special!!!! Yes, I’d love to hear back sometime what she does if you happen to be away for awhile. That’s really interesting that she picks her bones and then teases him with it. My first dog is a golden retriever (and our soon-to-be addition is as well) but he always greets you with a pillow in his mouth! 🙂 I definitely agree that it’s a calming behavior. We’ll have to see what Rae does! A pillow! That makes sense that it might have been a calming signal with your first Golden. Mr. N likes to empty out his entire toy box and display the contents to guests. I think he just likes showing off all his toys. This is all so funny, and something I’ve wondered about myself. Our Jake, some of you have read my “Jake Approved” reviews, does this when he’s going out for a ride in the car. He’s so excited he can hardly contain himself. The ‘toy’ is usually a sock or a slipper. I’m constantly looking for ‘the other one.’ Especially slippers. I’ll go put on one someday and it’ll be soggy and wet, or I’ll find it in the driveway or the back of the car. Our dogs are a constant source of entertainment and wonder. Thanks for sharing everyone! They definitely are a constant source of entertainment! It’s funny that you can find “Jake Approved Socks and Slippers” in so many convenient places, lol! This was great – our dog Sally used to do this too – and depending on how long we were gone had an impact on which toy she would bring us. I always thought of it as a little happy dance. How interesting! Maybe she picked out her very favorite toy when you were gone the longest because she was extra happy to see you come home. Thanks for the comment and adding to the intrigue! Hmmmm. We aren’t toy greeters. But Jack likes to take a ball or his stuffed animal when we go places. Maybe it’s related? It sure sounds like it could be related. Maybe it’s a type of security blanket or he’s really happy to be going somewhere with you. I agree with your thoughts that the final 2 reasons are most likely. Honey is especially likely to look for a toy when a visitor comes to the house (especially exciting). When the plumber arrived at my sister’s house recently, Honey went scrambling for her stuffed bear to show him. It’s a fuzzy, stuffed bear pacifier that keeps her from exploding with joy. Aw, that’s sweet! I’m picturing Honey hanging over the side of the sailboat, holding her stuffed bear to show her new dolphin friends, lol! Hi: Of course you get a toy or a shoe or anything else to hand. Most dogs have a retriever in their mix. As retrievers of game for centuries, they please their master/mistress with bringing the fowl to them, They have a job to do and it pleases. My back lab, Hector, brought me live pheasants when on a walk and was reproachful when I released the squawking birds. At home, Hector brought me a smelly sneaker from the shoe closet by the front door for which I thanked him. It’s just a breed trait – nice one, too. Hmm, that sounds similar to what Mr. N does from Tenacious Little Terrier. Could it be a little bit of showing off or wanting to play keep-away, maybe? Aww, so cute! Ace doesn’t even get up when I come home. I come and go a lot throughout any given day and he could care less! However, when my husband comes home around 5, boy does Ace get excited then! He gets up, runs to the door, grabs a toy and brings it to Josh. If there’s no toy to grab, sometimes he just runs to his bowl and chugs his entire bowl of water. Or sometimes he rolls over and starts rolling around with his legs in the air, doing his “happy dance.” To me, these are just things Ace does when he’s extra excited and happy! Aw, that sounds so cute, I can almost imagine Ace rolling around doing his happy dance while lying on his back. Drinking a lot of water surprised me though, I wonder why he does that. Maybe he’s stocking up preparing for a play session, lol! great theories! Mine don’t greet me but will pick something up the minute they see me and haul it outside so I have to pick up stuff all the time, they never seem to carry the stuff back in. Ah yes, that sounds familiar! I think all of my socks have spent at least one night outside at some time or another, lol! I don’t know why they do it, but I love it. Nothing makes me smile more than when Delilah greets me with a toy hanging from her mouth. It’s so adorable! Yes, there’s something about seeing them so happy, it just makes you want to do a happy dance too! Come to think of it, I probably have my own happy dance that Haley gets to watch when I get home, lol! My sister’s golden/lab retriever mix used to do this, though it was often with a shoe he found, not a toy! Our golden Sheba does it too, but she doesn’t really show me the toy, she just runs out of the house with it in her mouth! So I think she’s just happy I’m home, and it’s her little way of celebrating (or sneaking out a toy that usually I don’t allow her to take outside…LOL). No matter why, it really is just so cute! They do get sneaky sometimes with trying to take toys and things outside, don’t they Jan? Haley tries to sneak my socks outside when she goes out after dark. Leroy does the same thing and I’ve always wondered why! He usually grabs one of my shoes but lately I’ve brought more of his toys downstairs and he grabs his favorite one. He’ll also do it sometimes when it’s time to go outside. He’ll grab a toy or shoe and run around our pool table. Shoes seem to be a popular choice for this routine. It’s a wonder any of us have shoes or socks left to wear, lol! Pierre ALWAYS brings us a toy. My Golden Retriever did the same thing. Bentley doesn’t bring anything but a belly in need of rubbing to me! LOL! When Chewy’s super excited about his humans being home, he just has no idea what to do with himself! He’ll alternate between flopping over for belly rubs, jumping, running in circles, searching for toys, sitting on laps… I do think that having a toy in his mouth helps him be more calm, though! That’s a really interesting question – I wonder too! Lucy often greets me with a ball or toy in her mouth, but when I try to take it and play, she acts like I’m hopeless and just don’t get it. I do love when dogs do this though – it’s so cute! Here is a weird variation of this question. My 6 year old Yorkie named Riley greets everyone who comes home (my husband and two daughters) with a toy except for me! He has been doing this for years! Usually I arrive home after my husband and twice in the past month I confused him by arriving home before him. He came to the door with a toy, then when realizing it was me, threw it behind him as if to say, “Oh it’s you. You don’t get a toy.” The first time I happened I thought it was just a fluke, but when it happened the second time, I realized it was intentional! I am this dog’s primary care giver and the only person to feed him and take him for walks. Not sure if that has something to do with it. Maybe he thinks giving me a toy will distract me from giving him food? It is very strange, but I can’t help but wonder why he brings everyone gifts except me! LOL! This is so interesting, Maria. The first thing I wonder about is, do you greet him in the same way that your other family members greet him or do you have a different pattern of doing something specific with him when you first get home, such as feed him or take him outside right away? Jackie and Lindsay left similar comments about their dogs and I wonder if it’s some type of routine they have associated with different family members. Wouldn’t it be funny if in their minds they’re thinking things like “this person loves toys when they come home” or “this person prefers to go outside when they first get home”? Yes, now that I think about it, I definitely have a different routine with him than the others. Depending on the time of day when I return, I usually get him food or take him for a walk. I’m the only one who does this. You are right. I think he feels he needs to follow the same pattern every time with whoever it is that comes home. You definitely have to laugh when he realizes it’s me and tries to throw the toy away! “Whoops! I made a mistake! Let’s pretend this never happened! Carry on as usual!” LOL! My 6 month old jack Russell greets us everyday with a toy or chew and then when we sit down walks across our chests head with the toy and his tale wagging madly. Not sure why he does the walking around the head and chet thing? Any ideas? I believe it is invitation to play. My dog tosa inu does that every time I come back from work, shop etc. He grabs his favourite toy and throws it to my feet then takes it again and throws it away and hunts for it (most of the time it is ball, sometimes it is squeeky toy). He does his funny body dance and nose vocal sounds like he is carrying a prey and then it is running away and he shows me we have to hunt it right now together. I think he believes my homecoming is bringing back food from hunting – just like in wolves packs. When I join him in “hunting” for ball he catches it and puts it on my laps and chew on it putting it in my hands like he wants me to chew on it, too. He just want me to know he would love to hunt with me when I’m gone. He want me to know he is ready to be a part of hunting pack. That’s my theory. Hi, Pati! I hadn’t heard of the Tosa Inu before so I just looked at some pictures of the breed and they are beautiful dogs! That’s so interesting how he throws the toy away and then wants you to hunt it with him. I think you’re right, he might want to go with you next time to stalk and hunt some prey in the aisles of the grocery store, lol! It doesn’t sound like Tosa Inu’s are known for hunting, but I wonder if he would enjoy that or if he would like to search for hunting bumpers (made for hunting dogs) in a field. He sounds like a wonderful, playful dog! Tosa’s have German Pointers, Mastifs of many sorts, Great Danes and Bullteriers in their bloodlines which all are known to be hunting dogs in their past. Well it actually doeasn’t matter – dogs are predators who live in packs even in the wild, right? Hunting instincts, pack hierarchy and percepting world mostly by their noses are rather obvious for their spiecies. Althought Tosa Inu’s were bred for fighting in Japan you wouldn’t know that just by interacting with one of the tosa dogs if you meet one before reading history of the breed. They’re sweet, loyal and very friendly dogs. In my opinion tosas are most intelligent from all giant dogs. They don’t react as fast as german sheperds (they need to think about what you really want before they act) but they’re not as temperamental as german shepperds. (They always think and analize before acting even in difficult circumstances). Last time I have potentially dangerous situation as I was on a walk with my 80 kg Tosa Inu when suddenly german shepperd got out from his yard and started to running to us with barking and growling. I was afraid my dog would drag me on a leash to that dog but no. He was standing as stone statue protecting me waiting for german sheperd to come closer. Gladly GS had some second thoughts about the attack and two meters in front of us changed his mind and run in opposite direction whining. Tosa didn’t move or bark. You could barely hear silent growl in his throat but he didn’t act aggressive – he was waiting. This is what I love about them – self confident, silent, proud and loyal. They’re not histeric, erratic or aggressive (if properly raised). It was so nice of you to share this great information about Tosa Inus, Pati! I’m really intrigued by them as I had never heard of the breed until you left your original comment. They sound like amazing dogs and I’m glad you pointed out that they require the right type of owner that appreciates and respects their nature and breed. It’s interesting how they analyze situations and are not very reactive. The german shepherd you described must have sensed that quiet strength and knew to make a quick retreat. Still, that must have been a little tense, not knowing what might happen. I bet you were so proud of him for handling that so well. He sounds very sweet and loving. The story about the toys when you had a headache was endearing and I would love to see a video of him getting into the car, lol! If you upload any videos or pics to YouTube or a website, please let me know as I would love to see them. Thanks again for taking the time to share with us about Tosas, it’s always good to hear the other side of the story when it comes to certain breeds that have been banned or discriminated against. Also, your English is wonderful to say you don’t often use the language. ? Hi, I have worked with dogs for some 12 years and its more common in younger dogs. Its a simple presentation of a kill. “Look what i have got, let me show you”. I agree that it’s a “happy” to see you gesture. I have also noticed these dogs want to show you the item they have just brought you but don’t want to initially give you the item. That’s interesting that you’ve noticed it more in younger dogs and I think you may be onto something with the “kill” theory. I know Haley doesn’t want to give up her toy right away either, she’ll give it to me but then wants to take it right back. Very interesting theory! ? My dog Hairy doesn’t greet me with a toy but when he wants me to follow him he will grab a toy. When I acknowledge his toy he will walk down hallway…stop and look back to see if I follow or not…he does the same thing if he wants me to join him outside in the backyard. This is so funny because I wonder sometimes whether dogs think the toys are ours and that we like to play with them. Haley will sometimes bring me a toy but I’m busy and I ignore her, then she brings me a different one and then maybe even a third toy until I finally feel bad and play with her. But in her mind, maybe she’s thinking “Oh, she wants to play with the stuffed duck today”, haha. Hairy sounds like a really smart dog and maybe he’s luring you with what he thinks you like and want to play with. It’s kind of a far-fetched theory but sometimes I do wonder about that. My golden doodle is a very friendly 4 yr old dog. She is very submissive to other dogs. She is know in the neighborhood for wearing a bow in her hair and carrying an unstuffed toy! She always greats us with something and it’s usually an unstuffed toy or sock! The unstuffed toy is what I am interested in knowing about. She gets a new toy and carries it for a few days. Then pulls every ounce of stuffing out and carries the shell! Something told me this is called pelting…? Should I be doing something? Or is it ok? Hi, Kelly! Your golden doodle sounds adorable and it’s such a common thing for dogs to destuff their toys. Some people say it’s a predatory activity that traces back to when dogs were wild and had to tear apart their prey in order to eat. So much of how dogs play is related to the behavior of their wild ancestors but it’s nothing at all to worry about. I don’t mind at all when Haley destuffs her toys because it’s such an enjoyable activity for her, but I do buy some heavy duty stuffed toys sometimes that can hold up a little longer. My dogs don’t greet me at the door with a toy, but sometimes Rodrigo will grab a toy when it’s time to go potty. He drops it at the door, because it’s an “inside toy.” But it’s so funny to see. If he doesn’t have a toy at hand, he’ll dig one out of the toy bins. That’s so funny, how Rodrigo knows to drop the inside toys at the door. Haley still tries to sneak my socks outside if she decides she has to pee in the middle of the night. For awhile there, she had a whole collection scattered around the backyard, lol! My old dog used to do this, he was a westie, but my chihuahua mix does not. I didn’t realize there were so many possible explanations – and I still have no idea why. I think it’s to get attention – but then again, dogs always get our attention with their waggy tails when we come home. Yes, it’s such a common but strange behavior. Whatever the reason, I can’t help but smile every time Haley does it. Lately though, she’s been wanting to grab whatever I happen to be carrying when I come through the door. Sometimes it’s the mail, sometimes it’s a shopping bag, but she likes carrying it to the lovefest (aka wherever we settle down to have a greeting and belly rub), haha! I have always thought it was because Thunder loves me. I am going to stay with that because if it is not true I don’t want to know. After all, his reasons are my fantasy and I am sticking with it. That sounds like a great theory to me, Peyton! ?? I’ll go with ‘it’s a retriever and that’s what retrievers do’! Amy always brings little gifts, bones, stuffed toys, .. It’s just so darn adorable! She also likes to bring her kong, dog toys, so we can fill it with some paste! You could be right, Valerie! You’re definitely right about it being so darn cute. ? My Lab does this too….. Sometimes it’s so annoying that it won’t even come to greet me if it doesn’t find anything to put in the mouth. Sometimes, it even runs to the neighbour’s house just to fetch something in the mouth when some one arrives. Any solution to stop this? It’s funny that you asked that because we recently had to find a way to keep Haley from running around when we got home after she had her knee surgery. We put a little container of treats right inside the door so we could keep her near us and interested in the treat until she calmed down a little bit. We would have her sit for a minute, then reward her. It worked great to get her mind out of the “running around” routine. This would probably work for your lab too since they’re usually very food motivated. You might have to use the treat or treats every time you come home at first, then you can start slowly phasing them out over time so your dog gets used to the new routine when you arrive back home. Even after they learn the new routine, it’s always a good reinforcement to give them an occasional reward. Good luck with the retraining and let us know it if works! ? I think it’s an excitement thing too. Rosie will try and take her teddy bears out on walks and car journeys too! Usually the car has three or four bears in it that she’s sneaked out with her! Heart exploding cuteness tho when u turn to leave for work and she’s standing there with her bears in her mouth! Aw, Rosie sounds adorable! It must be so cute when she wants to take her bear along on a walk. ? Wouldn’t it make the work day so much better if you could take her along, too? ? My dog does the same thing she always greets me and my whole family with a toy! She’s a golden doodle and she’s a mix of a golden retriever and a poodle so I wonder if it’s cause she’s mixed with a golden retriever! My Chihuahua/ Jack Russell mix always brings me a toy (usually his Favorite) when he wants to go out to pee. Even if he is by the door, when I get the leash, he will run into the other room or wherever he needs to in order to get his “puppy”. It is the only time he drops his toy at my feet. When we play fetch we also have to play “try to get the toy out of my mouth”. I am so curious about this. He is four years old and just started this about 9 months ago. I sure wish we knew more about what they’re thinking, don’t you? That’s such an adorable behavior that he wants to take “puppy” along outside. It’s also interesting that he just started doing this recently. Whatever the reason, it’s just so darn cute! ? Thanks for stopping by and checking out the blog, Charlene. ? My 2 older dogs (hound dog and mini schnauzer) don’t do this. In fact for the most part they don’t care about toys at all and never have. However my shih tzu is a toy maniac. He doesn’t greet at the door with one but will run into the room carrying one and if for some reason he sets it down and someone calls him into another room, he will grab it before running off or stop halfway to the other room, when he remembers it, and come back for it. He has hundreds of toys and hates when they are picked up and put in one spot so I can vacuum. He will not so patiently wait until I’m done and then scatter them again. He also likes to bring toys on my bed. If I’m in there watching tv I’ll have 5 or more toys up in the bed by the end of the show. Lol! Your Shih Tzu sounds like he’s full of personality, I love it! I’m imagining you rolling over in the middle of the night and hearing a loud squeak from one of his toys, haha!? Thanks for stopping by and sharing, Mary! My dog Max (7) is a wonderful pet. He is half Wippet and German Shepherd and yet smaller than a pure Wippet. He brings me his leash when he wants a walk and he’ll bounce a tennis ball in front of me when he want a run in the back yard. A friend of mine Terry, who visits rarely, is the catalyst for Max to go absolutely ballistic. He runs around looking for a toy or anything he can carry to present to Terry and leaps all over him licking and trying to get to his face. Terry and Max first met when Max was very new to me, a 12 week puppy, and they have bonded ever since. He knows all the names of my family members (and of course Terry). I have never seen this behaviour in a dog before. Oh my gosh, Max sounds like an amazing dog with such a playful and unique personality! I bet Terry loves Max just as much as Max loves Terry. Isn’t it funny how dogs react to certain people? It’s almost as if they see them as another dog…no offense to Terry though, lol! I can tell there’s lots of fun, laughter and joy in your home from having Max in your family.? Thanks for a funny and interesting article. Our boy, Murphy, a 4 year-old Beagle-Cocker Spaniel mix always greets me with a toy. I read about it in a book on dog behavior and instinct and that book said it was the pup’s way of sharing and saying “Im glad you’re here!” The pups share something of their own as if to say, “Look! I have this and I’ll share it with you!” I guess that’s kind of a romanticized way of looking at it, but I like to think it’s true. Thanks again for a great post, I can’t wait for another one. I like to think that’s true too, Robert. It sure seems that way, doesn’t it? It’s kind of like when we humans invite guests over to a dinner party maybe. Murphy sounds like a very sweet boy. Thanks for sharing this! ? Our rescue lurcher does this with the first thing that comes to hand (or should that be mouth? ), be it a shoe, boot, slipper or toy. She runs around with it after showing it to the person entering, anyone, not just family, then deposits said item in her bed, or in the summer, in the garden. So funny! She can have a pile of toys or shoes in her bed! We’re always searching for “the other one”! She also takes her toys into the garden, a squeaky squirrel has gone missing, I wonder if a fox took it lol! I just love all these amusing doglets! Aw, that’s so funny and cute, Sue. Between your doodle and your lurcher, I bet they keep you laughing all the time. It’s a good thing she doesn’t bury the shoes or items in the garden, haha! I could see you out there raking through the soil looking for your missing shoe.? My beautiful Rotti who passed 7 years ago, always greeted me & most visitors with one of my soft hiking socks in his mouth (brought him home as an 18 month old protection trained dog, so he had no puppy toys) He only ever did it while greeting. Although he was fierce when pissed, he was an incredibly sweet natured boy. Friends thought he was bringing a gift but he never gave it up & he’d look confused if someone tried to take it from him, while backing up. Due to his imposing stature & fiercely protective side, I often wondered if it was his way of showing that he meant no harm. Can’t bite while holding a sock in his mouth, right? That’s so interesting, Paul. It sure sounds like maybe he was showing his softer, non-threatening side. I bet he was very beautiful. I just love Rottweilers and it sounds like he was an amazing dog. I’m sure you miss him very much. When Ponti was 13.5yo, when my vet had the “we must think of what is right for him” talk”, I was so choked up that I literally couldn’t speak. He wasn’t ill (although a little arthritic) ate his raw meaty soft bone diet with relish & still enjoyed a game. Ponti was just very elderly. I’d shed so many tears before he passed over, knowing that his time was near. Although not in the least bit religious, I have very firm spiritual beliefs. I meditated & I gave the Universe/God/Guardians/Higher Self my problem. A month or 2 later, at age 14, he woke me at 3am to take him outside, where I lay down & fell asleep alongside him on the lawn till sunrise when I awoke. Looking into his eyes, I told him how much that I love him, that it’s ok to leave me for a little while, I’ll be ok & to be waiting for me when it’s my time to pass over. He lifted his head & gave me one of his little kisses on my chin with the tip off his tongue, lay down & took his last breath. It was so peaceful, so beautiful that I didn’t even shed a tear & haven’t since. I felt relief for him that his passing was easy & painless. I think of him everyday with a smile. Just how privileged was I to have the honour of having such a special boy to 14yo? To want to not let go would’ve been selfish. I couldn’t have asked for, or expected more. It doesn’t end there. Ponti visits me in my dreams : ) At first, at some level in dream state, I’d realise that I hadn’t been taking care of him, like the weekly buy at the pet food shop for e.g., & that would awake me feeling anxious & upset. From that day on, I can’t remember the dream itself, but will awake feeling really good, ‘knowing’ that my mate had visited me. Swearing that I could never ever replace him, getting another canine mate was out of the question entirely. Nuh-uh, no way, never ever, not going to happen. I awoke not too long ago, with the strong ‘knowing’ that Ponti had ‘told’ me that it was time to get a new companion. Nah, can’t do it…….. Well, I guess just looking at ads for 18 month old pups wouldn’t hurt, you know, just out of interest. Long story short, a series of synchronicities led me to take home an 8 week old Rotti pup a fortnight ago. Not only did Zagan choose me (after rumbling with his brothers, he came up, said hello & then slept under my feet) I’ve no doubt that I was led to him. He is the best pup. Yes he’s a crazy little guy with heaps of energy but he’s just so perceptive of my needs, it’s as if he knew me from day one. Wow! This was so beautifully written and heartfelt, I don’t even have the words to adequately respond. 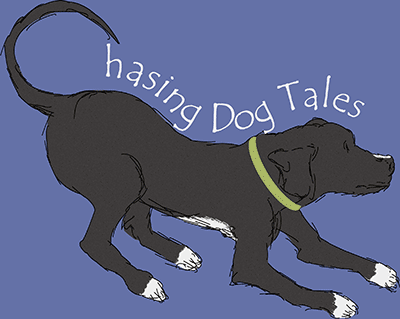 From Ponti’s passing to the journey that led you to discovering little Zagan, should give so many of my readers hope and comfort if dealing with the loss of their “heartdog”. Haley is definitely my heartdog and I’ve often wondered how I’ll be able to deal with that dreaded day when it comes. You’ve given me the strength and a good roadmap for that eventuality. You have the wonderful memory of getting one last sweet kiss from Ponti and his blessing to make room in your heart for loving yet again, until the two of you meet again. Thanks so much for sharing this story, Paul. I have to admit, I did shed some tears while reading it, but it’s also such an amazingly beautiful experience you shared with Ponti, I can see why you felt blessed and at peace being there with him. I wish you years of fun, laughter and love with your new buddy, Zagan.? CDT, “I just love Rottweilers”. Before Ponti, I was a German Shepherd kind of guy. My dogs are always happy & a big dogs tail can give a hefty thump to little kids & household objects. Choosing a Rotti with a docked tail & sleek coat was for practical reasons. Ponti was so sensitive to guests fear, he understood that he was imposing & would go out of his way to gently show people that he came in peace. His sweet gentle side reminded me very much of a Lab or Golden Retriever even (He guarded my son from when he was a baby & would quietly come get our attention when he woke) Rottis are not thugs by nature. Their protectiveness comes from love. I’ve seen over 15 of my past lives & have assisted others to witness hundreds of theirs. There’s no-doubt in my mind that physical death is just a new beginning. When people ask me if I can sense if their furry friends in spirit are still with them, I ask one simple question; ‘Did you love Schnookums?’ If the answer is yes, then off-course they are still with you. Love is the bond that can’t be broken, not even by ‘death’ itself. One of the most satisfying things I’ve ever done, is helping kids get over the loss of a pet. Sitting quietly with just a candle for illumination, I have the kids picture pup (or rat/budgie/iguana for e.g), in their minds eye. Holding their soft toys, I have them imagine cuddling them & tell them to say to their pet anything that they feel the need to. Tell their pet to visit them in their dreams. Rather than expecting anyone to forget a loved one, I encourage everyone to have photos of those in spirit, whether human or furry. I think my dog does this for attention. She has several attention seeking behaviors and I think when she was younger picking something up was a way to get (sometimes negative) attention. When she has something in her mouth she is far less likely to jump on the person who has entered the house. I think she uses it as a way to get noticed more. And it works! The person is likely to look at her and comment when she has a shoe in her mouth. That’s an interesting point that I hadn’t connected before. I just realized that Haley won’t jump up on us or anyone too if she has something in her mouth. That might be an alternate type of behavior training for someone with a dog that can’t seem to break the jumping habit. Maybe if they hand them something to carry, that might work. Interesting tip, Rachel!? My dog doesn’t grab a toy, but grabs me. He has to have a piece of clothing in his teeth and he’ll just stand there for a minute, wiggling his rear end like crazy and snorting every now and then. He doesn’t sleep in my room, so he does this every morning and every time I come home. Aw, that sounds adorable, Kelly! Don’t you just love all that wiggling and snorting, haha!? After a 3 day absence, we returned home to a different dog. Buster, a medium sized mixed breed has always gone in the car at least 5 days a week when we go out. This time he greeted us with a ball, not a favorite toy, but only releases it to sleep. Offering food or treat causes him to stop and seem to make a decision before he will take the treat. Caregiver notes this began on 2nd day of our absence. It has been 2 days since and he still holds the ball, makes no noise, often appears to play, but does not. Oh boy, that was really a change for Buster. It sure sounds like the ball might have been a “security blanket” for him. Is he letting go of it a little more now that you’ve been home for awhile? It’s so tough leaving them behind, isn’t it? Even if it’s just for a few days. Hugs to Buster from Haley!? My younger female Aussie is extremely attached to me. I was hospitalized recently and spent three nights and four long days away from home. When my husband and I got home, I went straight to bed. After the girls got over welcoming me home, my little girl left the room and returned carrying one of their four plush toys which she laid on my chest with a meaningful look. Whatever that look meant! She did this twice more before settling down next to me. It was me, sweet pup and three smelly stuffed toys. Okay, so I’m a soft touch for affectionate dogs. The Answer: Your dog needs to feel useful. You come in tired from THE HUNT. Your dog knows that, sometimes you even bring in bags of chicken, beef, eggs…what a hunter you are! Your dog needs to show you that s/he is worth his/her keep by showing you what s/he caught. In this case it looks like, um, maybe a donkey? I can’t tell by the picture. But catching a sock is good too, socks are important! They also demonstrate their superior chasing, stealing and tearing skills with toys by chasing thrown toys, teasing us and playing ‘keep away” and shredding the prey. My dog will toss the toy to himself then chase it, pretending I have thrown it. They are parading their skills, making sure you know they are Top Dog. Ah-ha! I never knew that, Hannah! !🙂 You may have just solved the great mystery here. as I said my dog does the same thing she doesn’t ever drop unless we take it out of her mouth . My little Chihuahua does this , he frantically runs around looking for something to bring me is so cute. The other day he couldn’t find a toy to bring me so he brought me some food from his dish. That was the first time you’ve ever done anything like that . my golden not only greets every visitor with a toy but if you bought her one (which most have) she will bring the one you got her. At first we thought it was a coincidence but after a week or two it became apparent she takes inventory. Guests love it and she is now showered with toys. How she keeps them all straight is beyond me but it tells me she is far smarter than i ever imagined and so loving. My little pooch always greets me with a toy and that’s the sweetest thing to come home to. Your help is needed. Sign the Guest book below for the fight against mills. This is an internet petition. It will be forwarded to the appropriate legislators. NO mailing list of any kind will be made from this Guest book. Any entries not pertinent to puppy mills WILL be deleted. Thank you for your participation. Whenever I get back into the car and he’s there he will climb all over me, right when I get in, so I have to quickly shut the door before he falls out of excietement. Not to mention when we leave him in the car. He will cry so much and law all the doors and windows he can reach. Once I found him in the front seat😯. Luckily I haven’t found anything wrong with the car- yet.